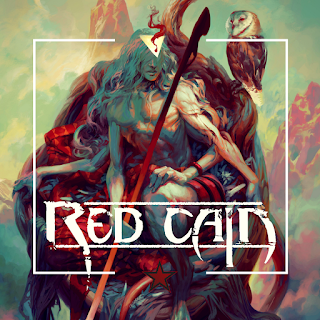 Red Cain from Canada hail over with their self-titled EP, containing 4 tracks. We kick off with a calm guitar solo and some orchestration, which builds up during the song. We then experience modern progressive metal, with some distant analogies to Kamelot and Symphony X. But the guys have their own sound, mainly stemming from the use of synths and electronic tunes. Meanwhile, Red Cain still sound heavy, with double-bass drums and great guitar leads. Singing is mainly clean, with some touches of the gothic metal direction, as you can perceive for instance on the EP’s second track, Dead Aeon Requiem. The third one, Hiraeth, which is also the first single of the band, is loaded with a dark, tense atmosphere and heavy riffs again. The fourth and final song, Unborn, nicely wraps up these great elements of style of Red Cain and showcases them in this dramatic track. In conclusion: Red Cain came up with a very enjoyable 4 track EP. All of the songs are technically and sound-wise perfect, and display a perceivable trademark sound. My expectations for their first full-length are high! Meanwhile, give this one a go. 9.5/10.